Eating out drives up your monthly bills, but cooking at home is a pain. We gathered 20 smart kitchen gadgets to make cooking easier while you save money. 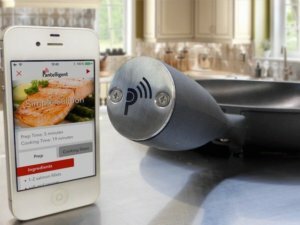 These smart gadgets can help you make fewer trips to the store as you cook food to perfection. This is a smart kitchen scale that has hundreds of recipes to walk you through step by step instructions. If you are low on an ingredient, it can help you resize the recipe to be proportional. 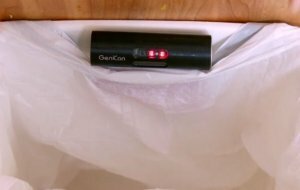 When you are throwing away empty food items, the GeniCan scans the barcode to add it to your shopping list. If it doesn’t have a barcode you can hold the item for 2 seconds in front of it and use your voice to add it to your list. Alexa is a must-have in your kitchen, and the Dot is the cheapest option. 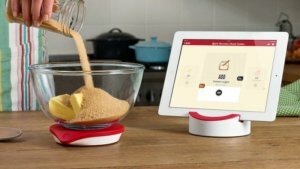 It can help you with recipes, shopping lists, and play music while you cook. If you don’t know what to cook for dinner, use the Campbell’s skill and it will help you find recipes. 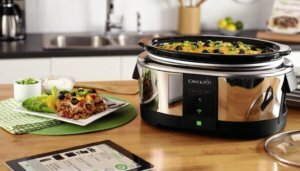 Completely control your Crock-Pot using your phone. No more wondering if it’s on or planning your day around starting the Crock-Pot. 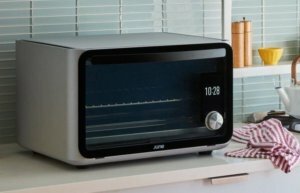 June makes it easy to cook by using sensors to monitor and cook your food perfectly. It does this by using a camera and recognizing the food. It also learns and adapts to improve over time. Hiku scans barcodes and uses your voice to add items to your shopping list. It is similar to GeniCan but you don’t have to talk to your smelly trash can. 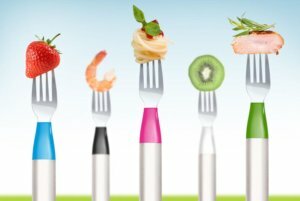 If you are looking to lose weight or be healthier the Hapifork can help. 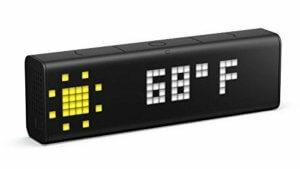 It monitors how fast you are eating and notifies you if you need to slow down. Quickly see notifications, news, weather and other useful info in the kitchen with the LaMetric Time Wi-Fi Clock. Perfect for when your hands are full in the kitchen. 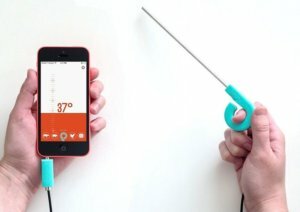 The Pantelligent connects to your phone and has a sensor to measure the temperature. You can know exactly when to flip your food with preprogrammed recipes. Place Amazon Dash Buttons where you keep your food. When you’re running low, press the button to order more food. 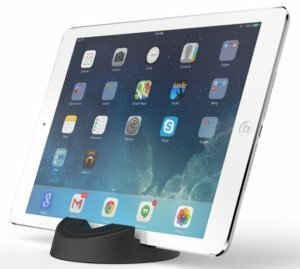 It is really easy to find recipes online and a tablet stand makes it convenient to read them. It can also keep your tablet clean while cooking when your counters get messy. Attach the precision cooker to any large pot with water and cook perfect food. The food cooks in a Ziplock bag. You use your phone to control the time and temperature. When cooking, it is easy to spill something on the ground. 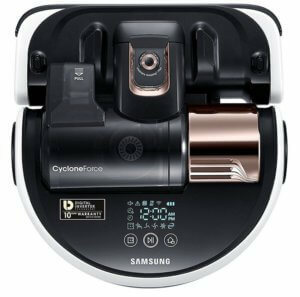 Grab the POWERbot R9250 remote, which lets you shine the laser pointer on the mess to have your robot vacuum clean it up. Awesome. 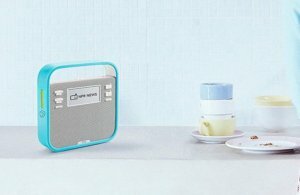 Slap the Invoxia Speaker on to your fridge using its magnets to make calls and voice commands with Amazon Alexa. It’s also portable, so you can take it on the go. 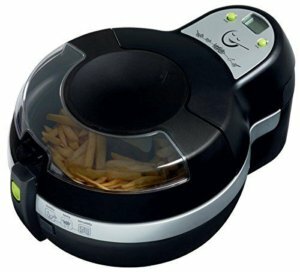 This is the only device that doesn’t connect to the internet or your phone, but I still consider the T-fal ActiFry to be very smart. Using only one teaspoon of oil, it can use hot air circulation to healthily cook your food. It’s really easy to clean and people love it. Leave the Range thermometer in the food while it’s cooking and get alerts from your iOS device when it’s done. 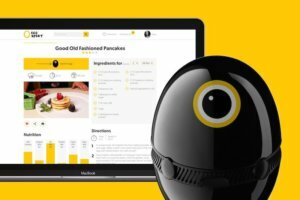 Hello Egg wants to be your kitchen assistant by showing you video recipes on its screen. 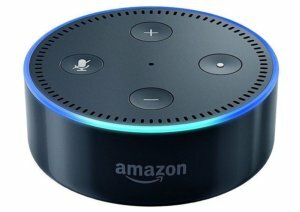 It’s voice-controlled similar to Alexa. 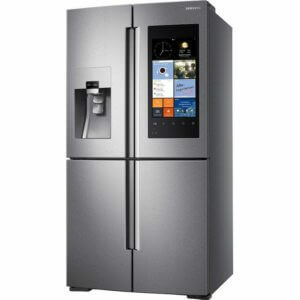 See what’s inside your fridge by opening up the door using the cameras inside and looking on your phone. While it seems unnecessary, it’s nice to know if you are out of eggs while shopping. The Family Hub allows everything you used to do physically on your fridge, like leave notes and pictures, to now be done digitally. 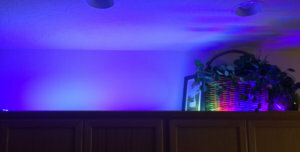 LIFX Z light strips can easily be placed on top of or underneath your cabinets. They have millions of colors to change to, in addition to different shades of white. LIFX Z can get really bright and also dim to set the mood in the kitchen. 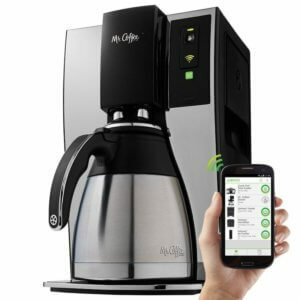 Use the WeMo app to schedule or start brewing right away. Now you can wake up and start the coffee without even getting out of bed. There you have our list of 20 smart kitchen gadgets. They can really help you spend less time in the kitchen and give you more time for eating and relaxing. 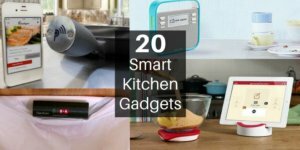 When you are in the kitchen, these smart gadgets will help you cook food easily and reduce the stress. If you have any other smart kitchen gadgets we missed, please let us know in the comments below.